The main players from 2014's 'X-Men: Days Of Future Past' return for this superhero follow up, starring James McAvoy, Jennifer Lawrence, and Michael Fassbender as our intrepid mutants, and Oscar Isaac as the title character. 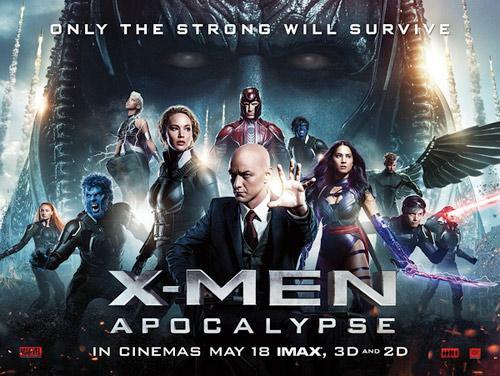 Returning director Bryan Singer was tasked with bringing fan favourite (if supervillains can be aptly described as such) Apocalypse to the big screen - perhaps sadly, not quite proving himself up to the task. After an intriguing period opening, strongly establishing the central villain, the latest 'X-Men' film trudges onward for the best part of two-and-a-half-hours. Character motivations are arguably non-existent at times, while fine actors such as Lawrence and Isaac are somewhat wasted. The former seems to have been handled a copy of a 'Hunger Games' script, as Mystique yet again dominates proceedings, with Lawrence even appearing disinterested by such an outcome. 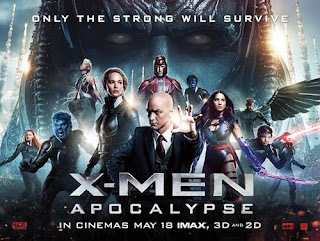 Disappointingly, 'X-Men: Apocalypse' (★★, 4/10) rounds off a rather middling triumverate of 2016 superhero films, alongside 'Captain America: Civil War' and 'Batman V Superman: Dawn Of Justice'. Jeremy Saulnier's 2013 cult hit 'Blue Ruin' showed the writer-director's incredible ability to craft tension in a stripped-down environment. He brings much the same atmosphere in 'Green Room' (★★★), where a punk band finds themselves trapped and fighting for survival, when they stumble upon the scene of a crime after playing a show to a group of neo-Nazis. The set up to 'Green Room' may feel somewhat contrived - particularly with Patrick Stewart playing against type as the head of the neo-Nazis - however, the audience is slowly and successfully drawn in to the story. If you're not familiar with Saulnier's work, then the film may feel startlingly violent, although the haunted expressions of previous collaborator Macon Blair deflect somewhat from the relatively absurd nature of the violence. "Visceral" doesn't cover it. Diane Morgan's Philomena Cunk has built up such a fanbase on shows like 'Charlie Brooker's Weekly Wipe' that she's landed her own BBC programme, 'Cunk On Shakespeare' - from one supposed genius to another. Much like Sacha Baron Cohen's Ali G (and to a lesser extent, Steve Coogan's Alan Partridge), this fictional character appears to be extending its lifespan much further than initially expected. The Ali G comparison seems particularly apt, as Morgan's character conducts several interviews in this educational satire, with the experts on hand seemingly unaware of Cunk's notoriety. Morgan's effortless delivery of lines written by Brooker et al is a joy to watch, with one takedown of hobnobs ("like eating a thatched roof") surely one of the comedic highlights of 2016 thus far. More please. Watch on BBC iPlayer for a limited time. Lenny Henry, who has brought me joy on many an occasion, very deservedly won an honorary BAFTA this month - partly for his ongoing efforts in addressing diversity on TV. The 'Jumanji' remake seems to be well on its way, with Jack Black joining Dwayne Johnson and Kevin Hart.